Build a Secure Linux Kiosk OS - FlatCoder Ltd, Freelance software developer UK. 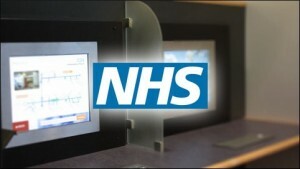 The original requirement was for a collection of 4 touchscreen information stands in a NHS hospital (providing information such as maps/”You are Here”, patient information etc.). It was absolutely critical that the system could not be hacked and that content was limited. The kiosks were to serve information from a local web server but some of the content being provided was from pages on the Internet. To that end, a further requirement was locking access to sites, only sites and content in a safe “whitelist” were to be served, making it necessary to block attempts to retrieve any other Internet content. Content via web browser. Browser must not have any controls (file menu, address bar, right click etc. ), downloads or similar. The Kiosk must not allow access to the underlying operating system and the browser must not be closed. The Kiosk will connect to the network via DHCP. The Server will always assign the same IP address to the same MAC (allowing for “you are here” to function). The Server runs a whitelist of allowed sites, requests to any other content are denied. The Server acts as a web proxy to cater for the “Internet Down” scenario. KiOS was built using SuSE Studio ( http://www.susestudio.com ). A base template “JeOS” (Just enough Operating System) was used. X11 was added as a package. Note that NO WINDOW MANAGER was used. This gives an advantage in that no window manager keyboard shortcuts are available/no update manager alerts are given etc. The Flash player was also added (optional and not necessarily desired in every scenario). The firewall was setup to block ALL incoming requests. NO PORTS are open. The OS was set to load at run level 3 (normal non-graphical console). The KiOS disk image is written to a USB pendrive. The system is set to boot off USB. No hard disk is required. This also benefits in that the “worst case scenario” typically requires just a reboot. If that fails, the pendrive can be removed and inspected or simply re-flashed. The pendrive in the real kiosk is locked away behind a secure panel. echo "Running KiOS first boot script..."
Effectively hiding the menu by default, causing immediate boot to the default option, and (worst case) if someone does intercept the menu a password is required to edit any options. /home/kiosk/.bashrc contains a simple “exec startx”. EXEC replaces the shell. Thus, if X dies, the kiosk user is logged out. /home/kiosk/.xinitrc starts Opera in Kiosk mode with a number of options. Namely – full screen, no keyboard shortcuts, no menu, no toolbar, no address bar, no saving, no printing, no downloading, no right click/context menu, a reset flag (if the kiosk is left unattended, return to the home page after a given interval), no “mailto” links, no history, clear the cache on exit, no ctrl-alt-del etc. /home/kiosk/opera.tar.gz is restored to /home/kiosk/ creationg a directory called .opera with one file – opera6.ini – containing other Opera preferences to lock down the web browser ( for more information see http://www.opera.com/support/mastering/kiosk/ ). This also has a knock on effect in that it tricks Opera into believing this is not the first execution – the EULA does not appear as one would normally expect. A new version of inittab is copied over to /etc/ that forces run level 3, turns off all TTYS (ctrl-alt-F1 etc. ), and automatically logs in the kiosk user. This combination now means that if Opera is killed, X dies, user is logged out and re-logged in automatically (i.e., the browser simply reappears!). Ditto if Ctrl-Alt-Backspace is hit twice (this was left in as a tidy way of restarting Opera if it crashes). A replacement xinitrc.common is copied to /etc/X11/xinit/ – the only difference being the suppression of an error message (by default, on login, a dialog appears complaining that no window manager has been found). The user can still Ctrl-Alt-F1 (etc.) but the terminals are all dead aside from the one running Opera. Anything killing Opera results in a logout/login/startx/start opera. In the real world – the keyboard on the kiosk has no Ctrl or F keys – but, it is still better to cater for every eventuality (keyboard!). Dealing with the USB stick and what happens if SuSE remove the Studio service? # raises the fallback trap of the sourcing script. The host PC should be set to boot from USB! The host PC should have a BIOS password to prevent changing of the boot order. It may ultimately be worth disabling Ctrl-Alt all together. Still need to investigate SysRq ( http://en.wikipedia.org/wiki/Magic_SysRq_key ) though on first inspection the only combination that works is Alt-SysRq-o to power down. Navigation Issues. There is no home button, back/forward etc. In the initial application of KiOS this is not an issue as the web page being used will handle it. In other scenarios, a navigational IFRAME could be used or limited toolbar buttons re-enabled. Customer did not want a screen saver kicking in, the screen stays on with “touch here to start”. This was fixed by adding “xset -dpms” and “xset s off” to the xinitrc before the Opera call. Touch screen drivers. The package x11-input-evtouch was added to the build in SuSE Studio. Setup the router (firewall, make it keep IPs per MAC address etc.). Setup server OS including web server. Write the kiosk client image to USB sticks. We then setup Squid (the web proxy software) to run on its default port (3128). there are tons of other options described in the squid.conf comments. Custom 404/redirect to HOME for sites not accessible. Firewall Server OS except for port 80 (web) and 22 (ssh for remote admin – will require port forwarding in router – no other outside ports should be accessible). Confirm all of this via both internal and external NMAP scans. Deploy the content to the server. Tweak as necessary. Server should be only MAC with Internet access. Everything else via proxy. Check squid logs to make sure clients are indeed going via proxy.